Corner Office was already reviewed by our team members a while ago, but since it really helped us to improve our working skills, we simply couldn’t resist from sharing it with you again. So today we’re bringing it to you as our Business App of the Month. Read our review and see how the app actually helped us. 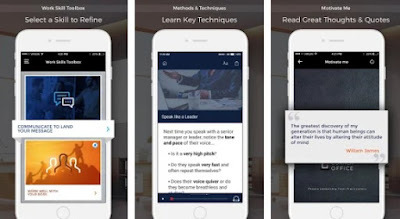 Corner Office is an incredible and innovative app that can teach you everything you need to know about leadership and how to improve your working skills. Now available on both Android and iOS platforms, this app provides work and leadership advice, completely for free and on demand whenever you need it. Plus, it is created with great design and well-packed features. Whether you want to boost your leadership and work skills with proven techniques or to learn the core essentials of an MBA, Corner Office will certainly help you out. With its 10+ convenient modules you will learn tons of different helpful things, from Communication Techniques used by Senior Leaders, to Interview Preparation, Principles of Management, Working with Human Resources, Business Networking, Project Management, Working well with your boss, Client Management, Career Growth Skills, Sales Success Methods, Efficient Time Management, and more. Each training module contains targeted methods which you will be guided through. Corner Office offers a complete work and leadership development platform on your Android or iOS device, available when you’re online or offline. You can have it for free from one of the following links!